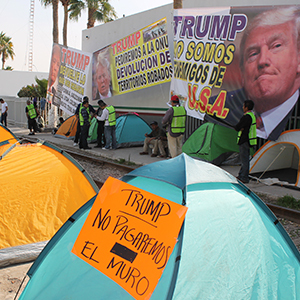 Tijuana, Mexico— Two weeks after President Donald Trump took the oath of office in the White House, and a week after he signed an executive order to move forward with building a wall along the US border with Mexico, migrant shelters in Tijuana are prepare to bear the brunt of events 4,500km north-east in Washington DC. “Physical walls don’t accomplish anything other than ecological damage, and emotional damage,” says Gilberto Martínez Amaya, the coordinator of the Casa del Migrante shelter. He explains that due to corruption and the ingenuity of migrants and coyotes – the nickname given to people who smuggle immigrants into the US, there is always a way to circumnavigate a wall. I wrote for The Tablet on civil society’s efforts to provide for migrants in Tijuana. Read the full report here. A glimpse of the grim situation. Thank you for getting way beyond the headline stories.